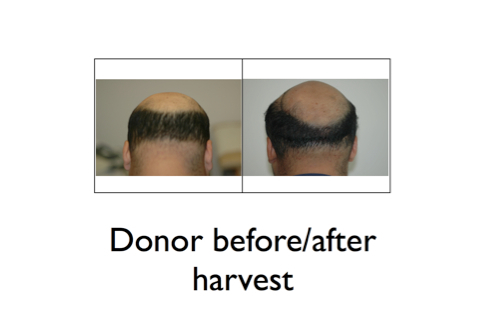 Having your hair transplant is just as important as post-surgical care. The secret to getting very fine scars that are minimally visible to invisible lies in the minimizing of tension vectors at the wound margins. Consequently, all my FUSS patients get two-layer closures. The deep layer, is the workhorse, it brings the wounds margins close or nearly touching by interrupted sutures. Then the superficial layer is closed with a running baseball suture. I use all kinds of sutures; always of course an absorbable suture for the deep layer, as this will stay in place. The choice of suture in closing the superficial layer is immaterial, as this suture will be removed anyway. A few days after your transplant you may feel well and ready for anything but it is important to remember that wound management can seriously affect your results. A question many of our patients ask is when they can get back to their work out routines. Here’s the question from the patient and the answer directly from Dr. Arocha. Q: When can I go back to the gym? A: Wait one week to restart your aerobic routine. Two weeks and you can go back into the gym and do light lifting as long as you do not pull on the neck area. Skin is plastic and has tremendous elasticity. That is why we call it plastic surgery, because of the skin’s ability to stretch. The scar or wound area is even more elastic because it is a weaker structure until that wound or scar matures. The maturation of a scar takes between six and twelve months. That is why it’s critical to limit weight lifting that pulls on the margins and by that I mean squats and anything that pulls on your shoulders and neck, which can stretch an immature scar. Eyebrow hair loss can be a very traumatic experience for any individual no matter their age or gender. Statistics estimate that over three million Americans experience eyebrow loss in just one year. Eyebrows play such a crucial role on our faces. They frame the eyes and help to express the emotions we are feeling. Fortunately, there is an alternative to penciling in or tattooing eyebrows to restore a more natural result. In the Slideshare Presentation below, Dr. Arocha covers the eyebrow reconstruction procedure. Presentation includes surgical and before/after photos. Recently, we received an email from a potential patient regarding shock loss, a phenomenon where the native hair falls out after a hair transplant (temporarily in most cases). Here’s the question from the patient and the answer directly from Dr. Arocha. Q: I have thinning and receding of my hairline and the top of my head. I’ve tried Propecia and Rogaine, neither of which have worked for the past few years. I’m afraid that my hair will shock if I get a transplant and I don’t want anyone to know I’ve had anything done. What are the chances? A: I am very glad first of all, that you’ve had the foresight to be on Propecia. It is the most efficacious medication there is to slow or stop the progression of AGA (androgenetic alopecia). Poor surgical hair loss is seen rarely in our practice. 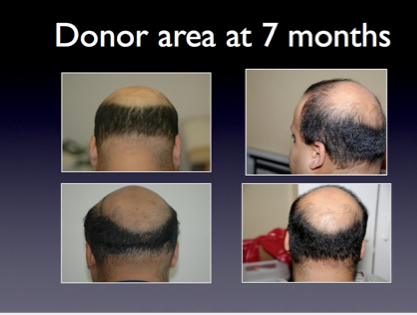 That is when the hair surrounding the transplant falls out after the procedure. This can be immediate, from cutting existing hair with the site marking tool, but is not true shock loss. It is temporary because the cut hair continues to grow. True shock loss is when the hair adjacent to the transplant falls out, going into a rest phase, returning in 3-4 months. With the tiny blades we use and the very refined surgical procedures used on our patients, the chances that shock loss will occur is very slim. If it does occur, it will regrow within a few months. If you follow pre and post op instructions, it will also increase your chances of preventing shock loss or other complications. For more on shock loss, visit our friends at the Hair Loss Q & A Blog: shock loss article. Another article on shock loss from Dr. Arocha.